As with many first collections, Campbell’s Definitions of Distance is strongly influenced by his memories. As a whole it is almost a cathartic journey through a childhood of bonfires, football matches and trips to the skip with his father. The title poem On Trying to Find Definitions of Distance sets the tone for the whole collection. In it the persona mulls over a long distance relationship, believing that it is worth the ‘209 miles, 3 changes, 1 metro’ and everything else to eventually get to his destination and the girl waiting for him. The poem is written in subverted triplets, each thought split from the next to mirror the persona’s disjointed thoughts on their journey. Campbell’s use of imagery quickens the poem’s pace, one moment seeing the space between them as a pool in which they ‘float through each other’s ripples’’ the next they are ‘hurtling [...] Red Arrows’ as the train gets closer to her. Finally he flips the tone of the poem, juxtaposing a rather methodical style of a list poem with a quirky romantic ending, leaving the reader satisfied with the outcome and ending the persona’s journey. His unusual use of ugly-beautiful and specific imagery is effective, adding depth to each poem’s narrative. He uses specifics to evoke nostalgia and although the ‘Calippos, halves of Kronenbourg’ and the ‘309 bus’ speak directly to someone of his generation, he makes sure it is accessible to people of any age, referencing songs by the Stranglers and Talk Sport Radio. His use of ugly-beautiful language, describing ‘chewy’ mud, and swans with ‘dodgem cables’ for necks creates the real image that Campbell intended for us, whilst still leaving a certain amount of interpretation to us. Campbell experiments with form, using free verse and incorporating dialogue, lists, the occasional half rhyme and ABAC structure to bring a poem to a close. He has a knack of finding significance in a trivial moment or thought, specifically with his use of metaphors. Sometimes he dedicates a whole poem to the moment, for example In Dead Fish at Hollybank Court where he describes the fish’s colour as ‘Parma Violets dropped to an oily playground, as it lies in an ‘open casket of conkers and dandelions’. In other poems he compares cranes to ‘taxidermy giraffes’, and a fall as accidental as ‘an envelope slipping down the back of a radiator’, this original imagery creating an intriguing picture for the reader. Location is clearly a strong influence for him, as he pays homage to specific places from his childhood, especially by the coast. 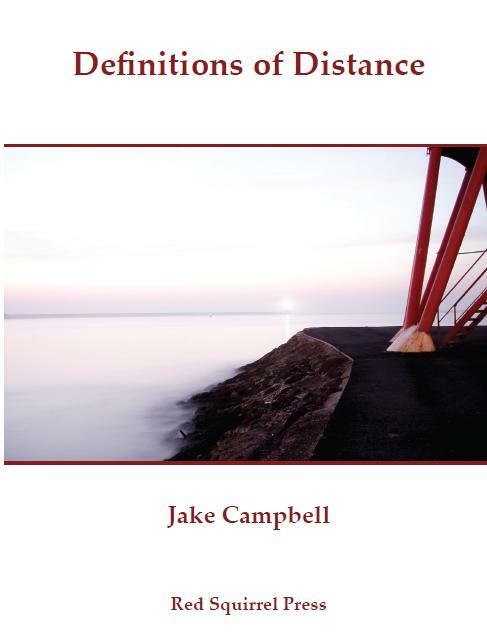 Campbell’s Definitions of Distance is a strong well put together collection and shows promise of great things to come for this poet. Although this is his debut publication from Red Squirrel Press, Campbell is already firmly on the radar of modern poetry. After gaining a distinction in his MA at the University of Chester, he received the Andrew Waterhouse Award from New Writing North in July 2011, which recognised his work as a talented new poet. His imagery, themes and experimentation with form show he is a fresh and quirky new name in contemporary poetry.